Les believes that nature presents us with a never-ending source of memorable images. He captures these moments and freezes them in time. The art of Les McDonald, Jr. has quickly become well known all around the nation. Les has lived in Houston, Texas since 1967. Les worked in advertising for nineteen years. 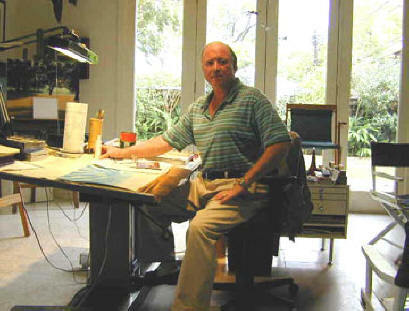 In 1986, Les became a full-time artist working in his favorite medium, watercolor. His subjects range from wildlife, landscapes, seascapes, to a wide variety of sporting art subjects. Numerous corporate clients and private individuals have contracted Les to paint personal commissions. Many of his clients have said, I can tell you have been there, referring to the accuracy of the subject matter he paints. His attention to detail has been one of the things he has become to be known for. His wife says that Les sees things through a different set of eyes than most people, that Les sees the details of nature as well as the whole scene. Les started painting when he was in the sixth grade. After coming in from hunting one day, he sat down and started sketching a duck. After getting more interested in art, he started painting. He started entering little competitions in the shopping mall in Port Lavaca, Texas and in the county fair. To his surprise, he started winning many of the competitions. His destiny was set. He has traveled from Argentina to Alaska doing commissions and for his search for new subjects.